Devils Tower is a monolith and popular tourist attraction in the state of Wyoming, rising 1267 feet above the nearby Belle Fourche River, with its summit 5,112 feet above sea level. It was declared America's first national monument by Theodore Roosevelt in 1906. 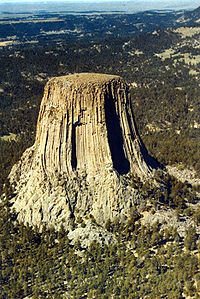 The top of Devils Tower is large, flat, and filled with wildlife despite its summit being over 5000 above sea level. The walls are almost perfectly vertical; the top is about the size of a football field. Chipmunks, snakes and other wildlife live on the top, over 1200 feet above the ground, defying any evolutionary explanation of how or why they originated there. All this is strongly suggestive of its having been formed by the Great Flood which submerged it. one theory is that it was formed by molten igneous rock forcing its way into the area's sedimentary rock, cooling before reaching the surface, and the sedimentary rock being eroded away. the other theory is that Devils Tower is the remains of a volcano, though no other evidence of volcanic activity has been found in the area. Both theories are baseless and absurd because there is no extrusive igneous activity in the area, and there is no evidence of volcanic activity in the area either. Intelligent design explains the rock well: it is a work of art worth seeing, and does not require fictitious, irrational "explanations" of the origin. The formation's official name contains no apostrophe due to a never-corrected clerical error. How Did the Vertical Columns at Devil's Tower Form? by John D. Morris, Ph.D. This page was last modified on 9 April 2019, at 02:16.